The Roll-A-Door will enhance the appearance of your home without breaking the bank! Each door is tailor made and comes with a range of features that deliver affordable quality, strength and durability. 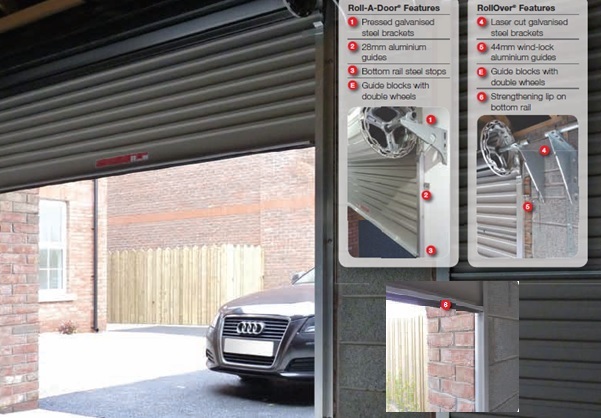 RollOver® is our premium roller door range which incorporates all the benefits of the Roll-A-Door with some added design features to improve the overall performance of your door. (4) Galvanised steel brackets, laser cut for a high quality finish and folded to gives remarkable strength. (5) The 44mm extruded aluminium guides on the RollOver incorporate a wind-lock design to provide extra wind resistance and increased security. The lipped edge wraps around the door, holding the Nylofelt™ securely within the guide. The highly polished surface adds a high quality touch, assists the door’s smooth operation and provides an incredibly sturdy channel for the door curtain to travel in. (6) The full width reinforced aluminium bottom rail on the RollOver has a strengthening lip. The rail houses the soft, pliable bottom weatherseal. Now that TiltAdor has done all the hard work ensuring your door will look great and operate reliably, all you have to do is choose a colour from our Colour Range.